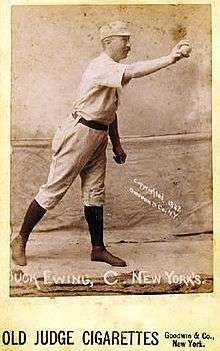 William "Buck" Ewing (October 17, 1859 – October 20, 1906) was an American Major League Baseball player and manager, and is widely regarded as the best catcher of his era and is often argued as one of the best players of the 19th century. ↑ "Ruth, Gehrig voted century's best". Associated Press. June 4, 1999. Retrieved December 24, 2014 – via HighBeam. (subscription required (help)).